So, you just got your hair treated at the salon and you are feeling great. Work it girl! However, you are substantially less wealthy (ugh) than you were before you walked in the doors. Every woman deserves to spend money on feeling great about herself, but it can be an even better feeling when you are able to save some money as well. Trust me, this is the only way. 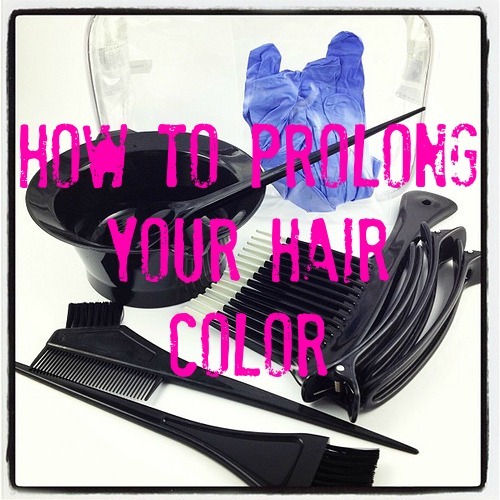 There are several things you can do to prolong your hair color. All you need is a bit of knowledge and a few other tools to get the biggest bang for your hair’s buck. Find out how you can keep your hair color looking fresh, whether you just got it done or you are looking for ways to hold out a bit longer to the next appointment. If you have just gotten your hair color treated, the first thing you need to know is to wait 48 hours if possible before shampooing it. This will help set the color and make it last longer. You don’t want to watch your color go right down the sink. Literally. When shampooing color-treated hair, use cool water rather than hot. Hot water tends to dry hair out and allow color to fade faster. And if possible, stick to the “every other day” schedule of hair washing – not just for the first time, but every time. The longer you can go the better. Choose shampoos and conditioners without harsh ingredients. Besides being bad for the environment, shampoos full of chemicals are tough on color-treated hair and can cause damage to it, stripping color and weakening it. No thanks! When your hair has been color treated, conditioning is a crucial step in keeping your color. A good conditioner will protect your hair from UV rays and dehydration. Find a product with natural conditioners such as avocado oil and shea butter. Use your conditioner regularly, after every shampoo. And be sure to deep condition your hair once a week. Or use olive oil. It works great! Food is more than just something to eat. Food was made to nourish every part of our bodies. There are many nutrients that a person can consume that will keep the hair healthy, therefore causing your color to last longer. Score! To keep your hair in the best shape possible, look for some of the following nutrients. Vitamin E, found in pine nuts and sunflower seeds, boosts the strength of your hair to prevent breakage. Essential fatty acids, found in many nuts, avocado and fish are also strengthening to hair. Vitamin C, found in green leafy vegetables, bell peppers, berries and citrus fruits, assists with collagen production. I also take Biotin to give my hair and nails a little boost. Sun can be damaging to newly color-treated hair, but UV rays can damage your hair even when the sun isn’t shining brightly. Take precautions when you step outside, and be sure to use one of the many products created specifically to protect your hair from the great outdoors. And when possible, wear a hat. Getting one’s hair color treated is a great “pick me up” and a perfect way to make a person feel amazing. When you look good you tend to feel good. But when you do, remember these tips that will help prolong your color and keep it shining. You can save money by stretching the time between salon visits, all while keeping your hair looking as fresh as the first day you walked out. Let me know if you have any other tips I may have left out.